When Dan and I started discussing his birthday, we talked about simply going out to dinner. But then we had the idea for a getaway weekend incorporating his love for aquariums. It had been a few years since our last trip to Chattanooga for their craft beer festival and a visit to the Tennessee Aquarium. So we decided to take a short trip (just a couple of hours from Nashville) to enjoy the city. I booked us a modern Airbnb loft apartment in the Southside neighborhood. My friends in Chatt told me that it's a great walkable neighborhood, and they were right! I was in love with the apartment; it was like my dream city apartment in a way, exposed brick and all. Walking distance to a great number of bars and restaurants too. Our M.O. for the weekend for the weekend became beer and aquarium, especially given the rainy weather predictions. The trip started off a little rough, with insane traffic Friday afternoon due to a semi-truck accident adding an hour to our drive. So we walked to Terminal Brewhouse for a late dinner, given we also lost an hour with a time zone change from CST to EST. The area around the Chattanooga Choo Choo Hotel has really grown up in recent years, so we were pleased to find a ton of options. They're even putting in a Frothy Monkey, which y'all know I adore... but that means it's crowded on a Friday night! There was a long wait (most places we found 40-90 minutes! ), but we eventually managed to get a table. Note to self, get a reservation for Friday nights in a college town. 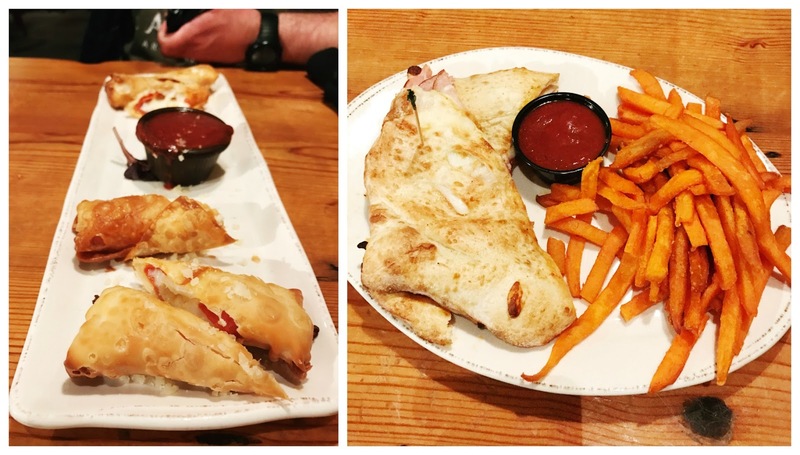 We started with Pizza π Rolls, which were basically pizza egg rolls. I really liked them! I definitely would love to make something like that at home. I indulged in one of their stuffed sandwiches, a calzone-type sandwich with fixin's. I had the Carnivore, with Italian sausage, pepperoni, ham, provolone, and cheddar, with sweet potato fries. Yum! Dan settled on some pizza, which surprisingly wasn't quite up his alley, but he enjoyed the craft beers. I was very happy with my Friday-night carb bomb of a meal! The next morning, we wanted to hit up the aquarium... but then we saw the insane lines and decided against it! We should have known that on a rainy Saturday, everyone would take their kids to the aquarium. 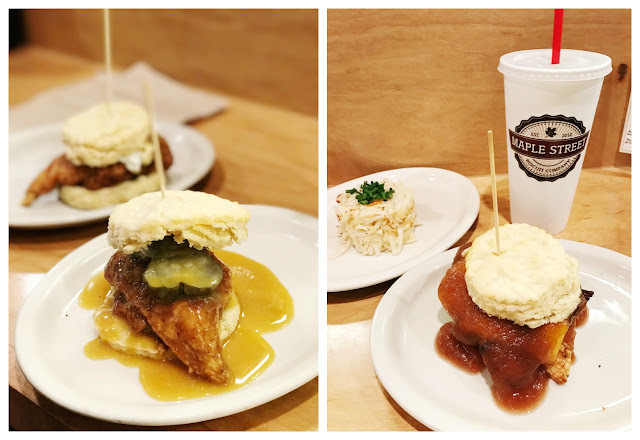 So we decided to grabbed brunch downtown at Maple Street Biscuit Company since we were already in the area. Dan had two biscuit sandwiches, The Squawking Goat with fried chicken breast, fried goat cheese medallion, and house made pepper jelly, and The Reinhold with crunchy dill pickles and housemade honey mustard. He liked the goat cheese the best. I had The Farmer with bacon, cheddar cheese, and apple butter, plus a side of hash brown cake. I wasn't a fan of the hash brown cake; it was really soft and not crispy or golden, which I prefer with hash browns. But my sandwich was awesome, and I'd grab a biscuit sandwich at this place again! Since it was rainy out, we decided to spend some time indoors at a couple of craft breweries. I'd run into the guys doing the TN Beer Run the week prior, and they recommended Hutton & Smith and OddStory, which are both on the same street. Dan had talked to the H&S guys before, so that was our first stop. It's a tiny taproom, but they have lots of great beers! We got some tasters and really liked them. We even took home a crowler of their Scotch ale, which means you definitely enjoyed the beer, right? That was probably my favorite beer while we were there. I also love their branding and tap handles. Very clean and cool! I totally fell in love with the taproom at OddStory. Part living room, part bar, part beautiful group hangout space, I felt like I could move in. I think that women are more likely to stick around a taproom that is inviting like that, which means the guys will stick around for longer, so they nailed it for me. And the beers were great! 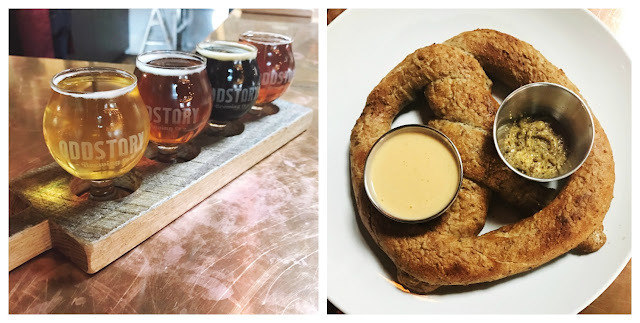 We had the beer munchies when we got there, so I ordered us their pretzel made from their spent grains. OMG, loved it. Beer cheese and mustard, one dip for each of us. (Dan's a mustard man.) Yum, and it had a great texture that you don't get from a concession stand pretzel. This one was legit. We lingered there for a long time, and it's probably one of my favorite taprooms style-wise in Tennessee. 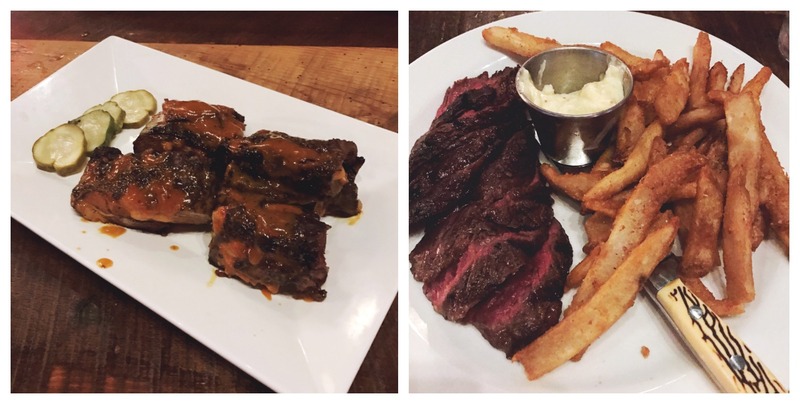 For dinner, I'd called ahead to Feed Table & Tavern back in Southside. They don't do reservations per se, but you can call ahead for a preferred seating time. We got a table right away at our designated time, and we were joined by a couple of friends for drinks and a meal. I indulged in cocktails that evening. I started with a gin Greyhound, which is my cocktail of choice lately. Then I decided to indulge in a tasty wine cocktail called the Sloshed Housewife, and by the end of THAT drink I was definitely a bit sloshed. Thankfully, we'd ordered Smoked Pork Rib Tips as an appetizer (yum!) and I had their steak and fries for dinner. Everything tasted good but their fries were insane. Definitely must have been batter-dipped and double-fried if you ask me! Feed had a cool, young vibe to it. On our last day in town, we decided to give the aquarium another go in the morning. 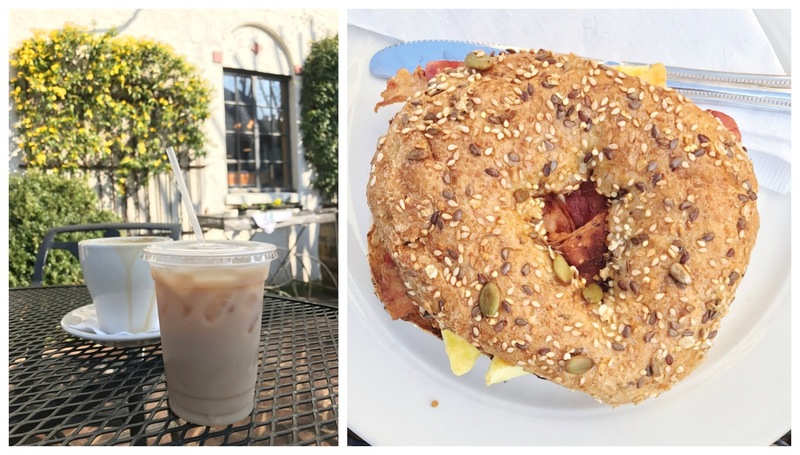 We parked in the aquarium lot, then walked up to the Bluff View Art District to grab breakfast at Rembrandt's Coffee House. It was crowded, but we found a nice table outside to enjoy the sun. My ice chai latte was perfection, and my bagel sandwich was too! The bacon was awesome, even though it took a bit of time for our food to be ready. We really just soaked it in, watched birds, and relaxed. Then we walked back to the aquarium over a pedestrian bridge by the art museum. We love the Tennessee Aquarium. There are two buildings, one for oceans and one for fresh water. We spent a lot of time in the ocean side looking at the seahorses, a giant octopus, and of course the sharks. We definitely want to go back once their lemur exhibit (yes, mammals!) is ready. While oceans get a lot of attention, the fresh water side of the aquarium competes to be our favorite. Tons of turtles, snakes, and gators... even otters! The fish aren't as pretty on the freshwater side, but they're just as fascinating. All in all, we had a wonderful weekend in Chattanooga and definitely want to get back sooner than later.